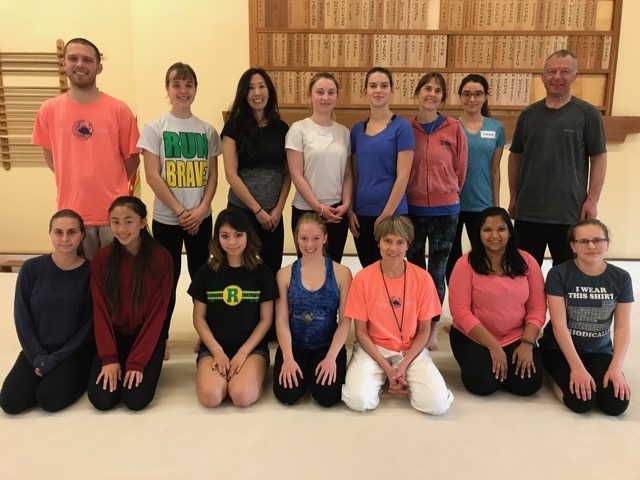 On April 21st, Ikazuchi Dojo sent three students to Seattle to attend Bruce Bookman and Melissa Pittman Fischer’s seven-hour women’s self-defense intensive. 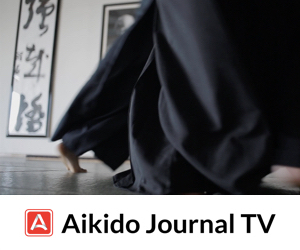 Aikido Journal speaks with the students who traveled to attend the seminar…. Aikido Journal (Josh Gold): Karen, Sophia, and Juliette, thank you for joining me today. 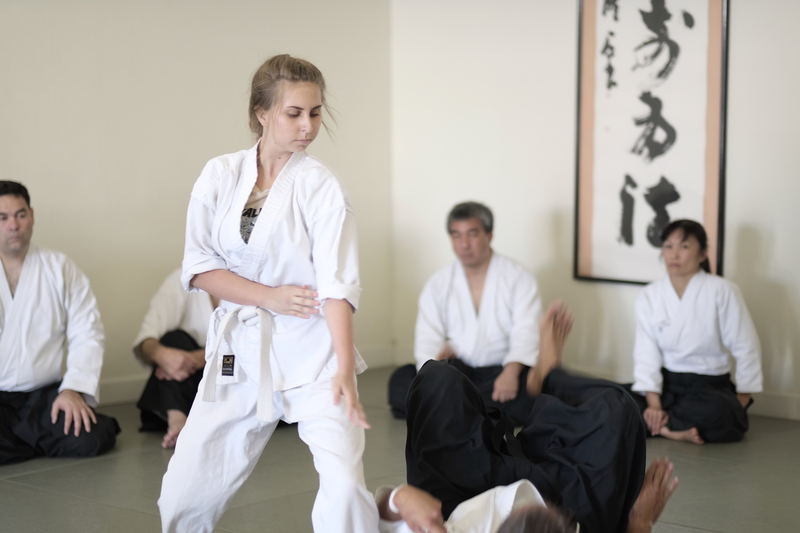 Let’s talk about your experience earlier this month at Tenzan Aikido Dojo’s annual women’s self-defense workshop. Karen Kim: I’d be happy to. Bruce Bookman Sensei and Melissa Pittman Fischer Sensei hosted a one-day, seven-hour self-defense workshop open to women and girls of all levels. There were about a dozen participants on the mat who ranged in age and experience from middle-school girls to young women university students to mothers like me. Several of us were aikidoka and a couple participants were relative newcomers or first-timers on the mat. Before we talk about the seminar, could you all share a bit about your martial arts background? Karen: Sure. 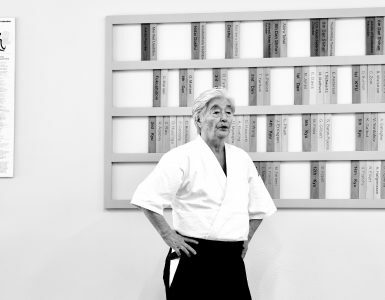 I started training at Ikazuchi Dojo in 2013 after taking an opportunity to participate in a women’s aikido class that the dojo offered and I was hooked immediately. I received my shodan under Haruo Matsuoka Sensei in 2017 and I’m now an assistant instructor here at Ikazuchi. Sophia: I’ve practiced aikido on and off since I was very young, but only started to train more seriously over the last two years. I’m pretty comfortable with moving on the mat but still have a lot to learn in terms of developing my basics. I’m currently 3rd kyu. 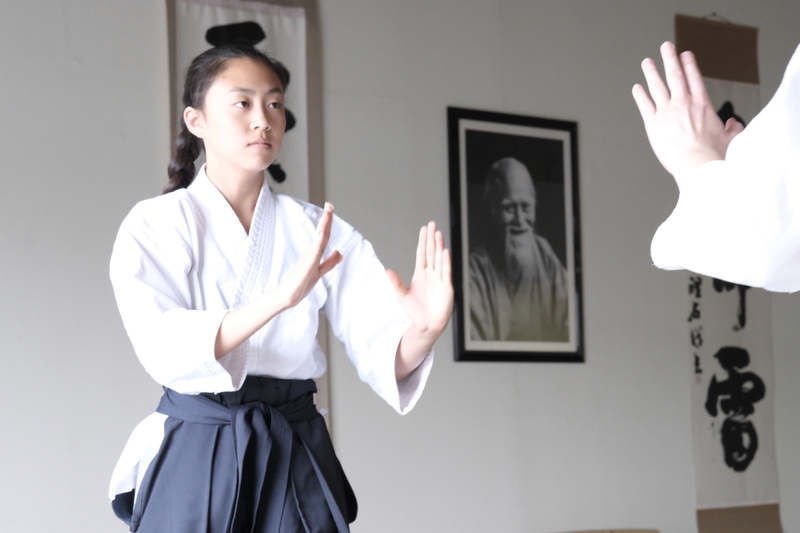 Juliette: I began my training at another dojo’s children’s program [Ikazuchi Dojo does not offer a children’s program presently] when I was 8 years old and I’m 14 now. I joined Ikazuchi Dojo in 2016 and now I’m 2nd kyu and training for my 1st kyu test. I train here about three days a week on average, in regular classes and sometimes in private lessons. JG: Sophia, how did you feel going into the workshop? You traveled all the way to Seattle by yourself to go through this self-defense intensive. Sophia: Going into the workshop, I was very anxious. I was worried that I might freak out, that I would freeze or not be able to use my voice. Looking back now, I realized I had a built-in inhibition to scream, even in a self-defense situation. After the workshop was over, my voice was almost gone because I was so loud. I felt more confident in myself, in my ability to fight back, and in using my voice as a weapon. I feel the experience gave me more overall confidence and helped me unlock something that I didn’t know I had in me. Juliette: I was also struck by how the instructors had us use our voices. The notion of women using their voices is one that has been condemned by society for years and throughout each simulation, technique, and drill, we practiced a form of negotiation using a firm voice with confidence. I was able to watch the advanced teen class before the workshop and I even saw the concept of negotiation introduced there. I also saw a form of it presented in the seminar and it struck me as remarkable, since it never occurred to me that I might use my voice with an attacker and that this could stop an attack before it becomes physical. JG: How was the workshop structured? What was the format? 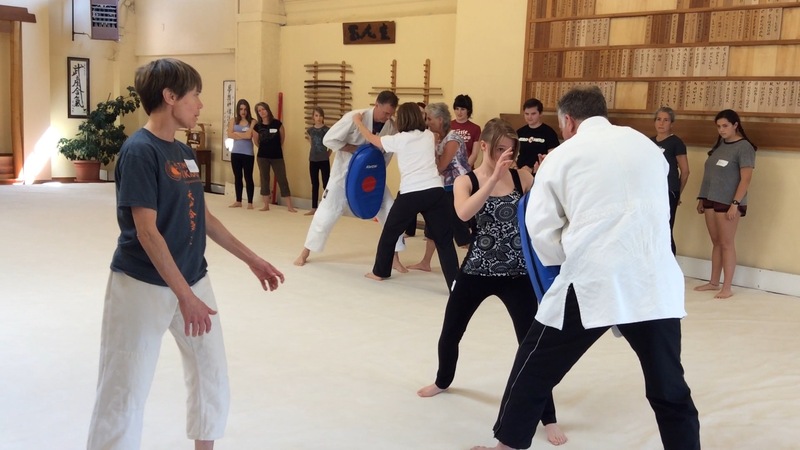 Karen: The workshop taught us how to assess an encounter, recognize an attack, and mobilize a series of simple yet effective counter-attacks, including head, groin, and eye strikes and kicks. We started with solo practice, then we paired up and practiced as a group, before we took part in simulated attacks with Bookman Sensei and Keith Bookman, who suited up in protective gear and pressure-tested our counter-attacks. There was time over the course of the seven hours to give feedback to our training partners and debrief as a group. JG: Seven hours is a long time! Karen: I thought so too when I first heard about the workshop, but I think the duration was essential to the effectiveness of the training for a couple of reasons. If we’re only meeting for one day, I think it’s necessary to train all day so that the techniques have a chance of becoming muscle memory. I also think we needed to spend that much time together to work through some of the jitters we might naturally feel training with a group of people we don’t know. By doing this, we could start to then chip away at the more profound inhibitions and reservations many women and girls have when it comes to defending ourselves. I think the workshop aimed to arm women with some basic counter-attacks, but it also sought to give women the confidence to determine when it’s appropriate to mobilize counter-attacks and to feel that our self-defense is legitimate. Sophia: Also, the environment was highly focused on making you feel supported, and I think that helped my experience the most. The workshop was centered around not just making you feel strong as an individual, but also the strength of the community of women around you. As the attackers were coming at us, one by one, the other women stood and watched, chanting in support. It made me feel empowered to come out of my shell, and it really made it a more positive and transformative experience for me. 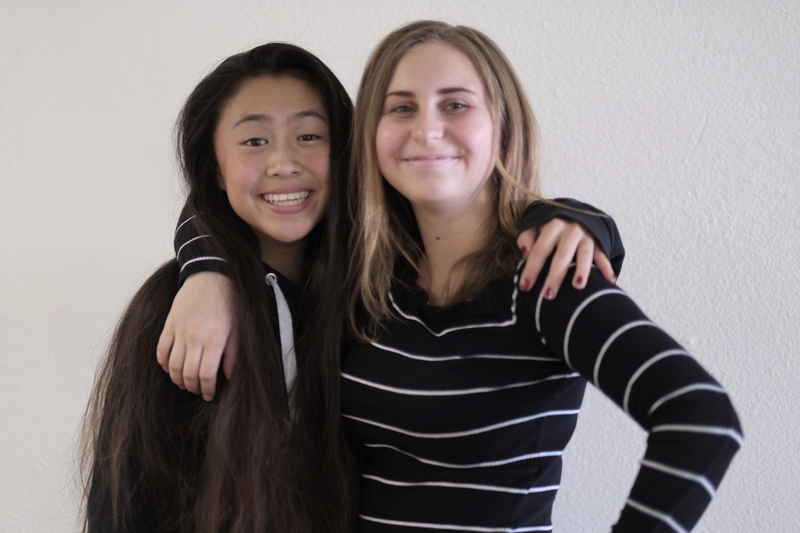 JG: Karen – both of our teenage daughters attended the seminar. As a parent, what do you think is one of the most important things they were able to get out of the event? Karen: I think teaching the girls that’s it OK to protect against your own vulnerability. Of course, this was an important element for everyone at the seminar, but I’m particularly glad that both our girls learned about this at a young age. At the workshop, we not only learned new self-defense skills, but we also learned to feel okay about using them. For instance, I was struck by something Melissa said at the workshop. She suggested we imagine our mothers or daughters or best friends under attack as a way to access and harness the energy needed to execute counter-attacks. One of the sempai at my own dojo has said the same thing to me over the course of my training to cultivate my martial spirit and, on Saturday, this proved to be a good tool as well. But what I found interesting is that this suggests that we may not feel entitled, even reflexively, to defend ourselves, that we need to imagine someone else’s vulnerability to feel okay about protecting against our own vulnerability. JG: That’s an interesting observation. Can you say a little more about that? Karen: Yes. I’m saying that it’s important to acknowledge, explore, and challenge constructions of femininity in any women’s self-defense context because these constructions don’t simply disappear when a woman is under attack. Unfortunately, they can inhibit a woman even when her well-being is being threatened. The workshop did a good job addressing this issue by helping us trust our intuition and get comfortable setting boundaries. The workshop also incorporated verbal and psychological self-defense skills by adding dialogue to the staged attacks. JG: Sophia, tell me about your final “boss battle” at the end of the seven-hour workshop. Sophia: The final fight at the workshop was a very invigorating and intense experience. The other women stood in a line along the wall, and I walked onto the mat. Across the room from me was Bruce, in full body padding. Another instructor asked me if I was ready, and I said yes. Suddenly, Bruce was rushing towards me, yelling aggressively. I advanced towards him using my voice at first, saying things like “Stop right there! Back off! Don’t come any closer!” When he continued to come towards me, I moved towards him and just started kicking. The adrenaline was rushing through my body, and I could feel my body shaking from the stress as he fought back. I continued to knee, elbow, and kick the pads on the attacker’s body, and he fought back. This wasn’t just a workshop where you kick someone a few times and you’re done. Not at all. In fact, the attacker continued to fight back until we went down to the ground. At one point, he grabbed my legs and knocked me over. I used the crab kicks I learned earlier, and continued to fight while I was on my back. Throughout the whole experience, I heard the chants of the other women in the workshop, supporting me. It definitely gave me a boost of courage. Finally, my attacker fell and tapped out. Another instructor sounded the whistle, signaling the end of the fight. I stood over Bruce and gave a final shout: “No!” After that I went back to the line of women, and got a few pats on the back. Overall, it was a highly empowering and thrilling experience. It was the safest, yet most realistic combat experience I’ve ever had. Bruce Bookman teaching “crab kicks” – a powerful defense when on your back. 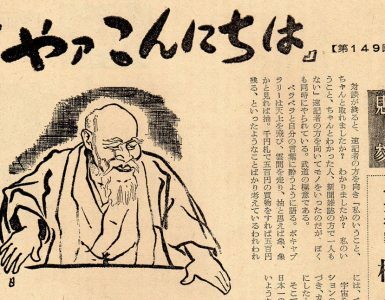 JG: When you were put in the context of pure self-defense in a high-pressure situation, how, if at all, do you think your traditional aikido training helped you? 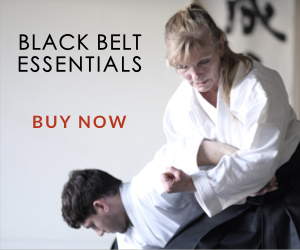 Sophia, you’re a white belt, but do you feel anything you learned in your regular training helped you in a highly stressful, chaotic self-defense challenge? Sophia: I think my aikido training helped me in two main aspects, the first being balance and the second being stress management. Aikido typically doesn’t focus on things like kicking (which the workshop did), but regardless of what we do, everything involves balance. Most of the techniques we do focus on taking away someone’s balance and learning how to maintain your own. Having a good sense of balance was very useful when we were learning how to use kicks and strikes with our knees. The second and most important thing that my aikido training helped with was my stress management. 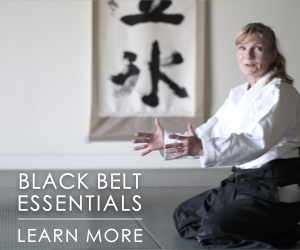 At our dojo, our kyu tests are pretty stress-inducing, even at the white belt level. It’s you, your attacker, and the entire dojo watching you. If you make a mistake or don’t get a technique to work, the uke will escape or counter-attack. Having this kind of pressure acts as a sort of “exposure therapy” for managing stress and makes your movements efficient while adrenaline is coursing through your body. 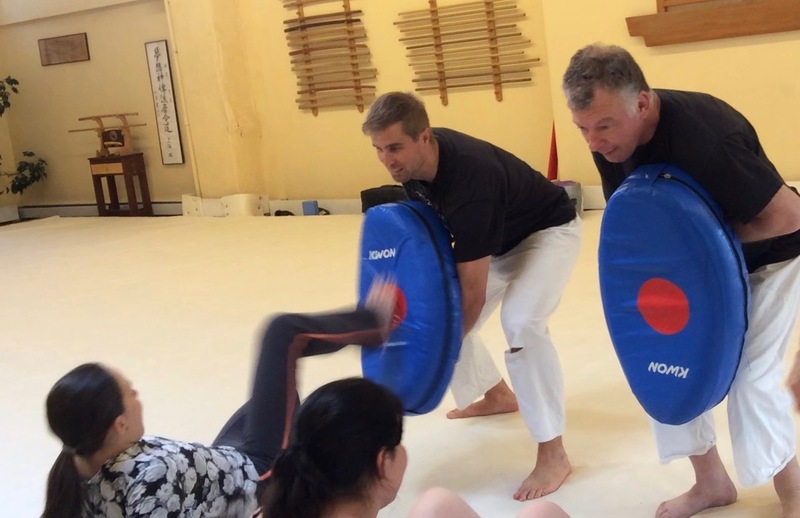 Learning how to manage things like fine motor control in high-stress situations was very useful for the workshop, especially towards the end when a man in full body padding is charging at you, full-speed. 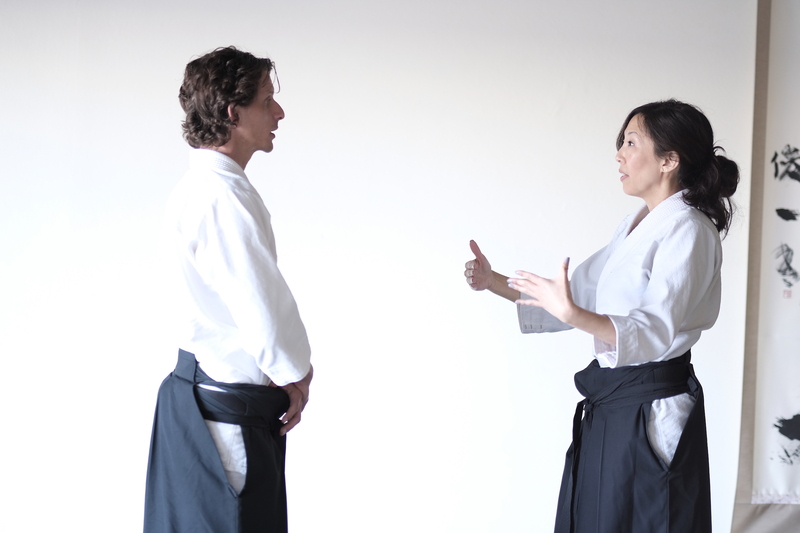 JG: What about you Juliette, were you able to find connections between your traditional aikido training and the training you received at the workshop? Juliette: Definitely. 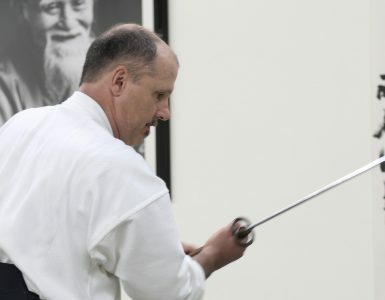 Aikido can be thought of as a method to neutralize or redirect an attacker’s power and although traditional aikido was not included in the seminar, its core concept was incorporated in the simulated attacks. I also saw a lot of components in the simulated attacks that are similar to randori. In my experience in randori training, it can be pretty frightening initially, but I’ve learned how to focus and work under that type of stress. Similarly, I noticed in the attacks from the workshop that it takes courage to face an attacker, even in a simulation. Both forms of training focus on the use of self-defense while building this type of stress inoculation in pressure situations where adrenaline levels are high. I felt confident by the end of the seminar and I think every student was able to gain that energy to deal with that type of stress. Randori requires constant training to create patterns in muscle memory and I found that over the seven hours we trained, the movement patterns and defenses came more easily. Originally in the workshop, I found some difficulty performing the defenses and would find myself stuck in the technique or struggling to maintain my core engagement. Nearing the second half of the seminar, I discovered that not only I, but also the other students were improving upon the experience and putting it into use. JG: So would you recommend the workshop to friends of yours? Juliette: Absolutely. The instructors referred to the set of skills we adopted from the seminar as our “toolkit.” I began taking comfort in the word as I was reassured that every student, myself included, had attained the skills needed to assess and defend in any situation. Overall, the women’s self-defense workshop was an experience I wish I could share with others, because so many people would benefit from it. JG: Karen, what did you find was one of the most remarkable things about the workshop? Karen: I’d have to say witnessing all of the women and girls in the group grow in confidence and competence over such a short period of time. It says a lot about the potential of these programs to become an integral part of all martial arts training, rather than just an occasional one-off event. JG: Thank you all for taking the time to share your experience with our community. I’m so glad you all were able to make the trip to Seattle to learn from Bookman Sensei at this special event. I fully and deeply agree which this idea. Personally, I believe that ALL students of Aikido, not just women, would be far better off to have experienced this type of training. 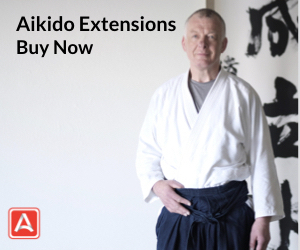 Especially these days when Aikido students have often not experienced any other martial arts training, they may have never, ever experienced what it is like to uncork and release every ounce of energy one can muster. Also, our normal training with its emphasis on caring for our partners means that few practitioners know what it is like to experience the fear and tension that comes with an all out attack. This type of training is designed to allow people to experience both safely. It can be transformative and my own experience is that students who have had some training of this sort ar far easier to teach than those who have not done anything like it. This is a way to push the envelope while still being safe and it is invaluable. Thank you so much for posting this interview. What a wonderful experience and I wish my daughter could join as well.